Have I ever expressed to you the measure of love I have for the Find A Grave website? If not, then read on! By the time you are finished reading this, you will know how much I love using this amazing online resource for my own Family History & Genealogy. I have found so much information on my family's ancestors just from this website alone! Oh, did I mention the website is FREE? What could be better than free? Okay, so Find A Grave is owned by Ancestry.com and we all know they had issues with their websites last week, but, come on, the benefits surely outweigh the controversy that occurred! 1. Findagrave.com is basically online Memorials that family members create and maintain. Many of these Memorials contain dates of birth, death dates, cemetery locations, headstone photographs, biographies, and some even contain photographs! Who doesn't love stumbling onto photographs of your ancestors. 2. When working "sideways" on your Family History & Genealogy you may find additional information by using the Find A Grave website. Many Memorials include parents, siblings, and even children. I have had a lot of luck when searching siblings. 3. Keep in mind that the majority of these Memorials are created and maintained by family members, however, there are a lot of contributors who simply visit cemeteries and upload photographs to the website - a great big "Thank You" to all the contributors!! These contributors create a Memorial for an individual. You, however, as a family member can request that these Memorials are "transferred" to you. This gives you the opportunity to update and add information to the Memorial. What are the Benefits of Using Find A Grave? The Find A Grave website is a FREE service! Find A Grave is an enormous community of family genealogists and family historians. Many Find A Grave users love to interact and connect with other family members. (see Genealogy Girl Talks Podcast #002 here or my blog post on Connecting with Family here). Their search includes a maiden name option. This assists when searching for the women in your tree. Searches also include various countries - it is not limited to just the United States. Have fun and search your surnames in other countries! You may be amazed at what you find! You can search for Famous people! Okay, so maybe you're not related to them, but it is interesting to see their Memorials! You can use HTML in your biography area of the Memorial! If you are not familiar with HTML, that's okay. You can leave flowers on Memorials of your ancestors! How neat is that? It's easy to sign up and join this growing community! Oh, did I mention it's free! Haha! So, what are you waiting for? Head over to findagrave.com and start searching! Let me know in the comments below what you find! I've used Find A Grave for years and been a FAG volunteer for several years. Love it. It's been a tremendous help to my own research and I love helping others find their ancestors' final resting place. Carol, I love Find A Grave, too. I even have my mother involved. It has been such a help for our family research, too! Thank you for stopping by and leaving a comment. I have been a Find A Grave member and volunteer for almost three years and love it! I haven't been able to go out and take photos over the last year due to my husband's illness and now my own, but it is something that I enjoyed doing very much. I have been helped so much by the other members of Find A Grave and it is a joy to be able to help others, too. Thanks to their website, as well as Ancestry and FamilySearch, I have added many leaves and branches to my family tree. I only wish these things had been available to me 25 years ago so that I could have shared this joy with my grandma. 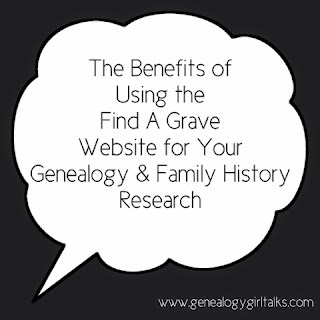 I wish more people knew about Find A Grave and all the valuable information on their website! Thank you for taking the time to add photos so others can find their ancestors. I always check cemeteries I drive by on my Find A Grave app to see if there are any requested photos. Its a simple act of giving back! I agree with you! My great aunt would climb cemetery fences (both over and under) to gather information on our ancestors! Just thinking about all the hours she spent at the courthouses and libraries amazes me. Now we can sit at home, sipping tea or coffee, in our pajamas researching if we want to! My how times have changed!